You are here: Home / branding / How to Get Noticed in the Holiday Marketing Noise! 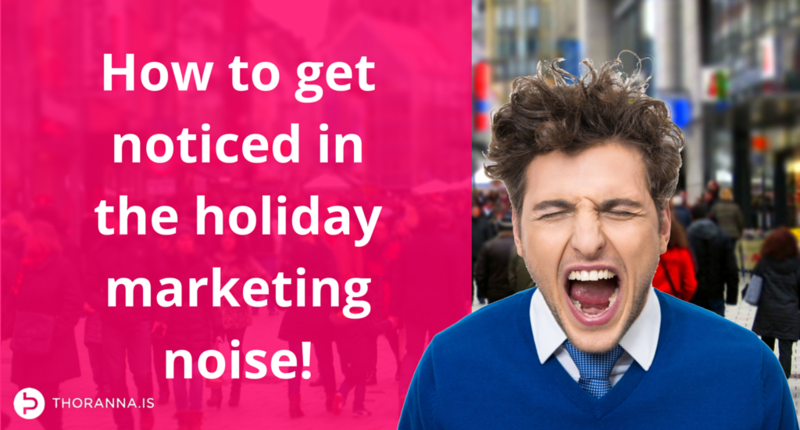 How to Get Noticed in the Holiday Marketing Noise! There is always noise in the marketplace, but probably never as much as late November and through December. For many business owners, the run up to the holidays is a stark wake up call, when you can feel your marketing messages drowning in a sea of advertising and craziness. You need to focus on your most receptive and profitable target groups now more than ever. With everyone shouting and vying for everyone’s attention it is easy to drown in the noise. Make sure you know who you want to reach and do everything you can to reach only those people with the best possible message to get their attention. This means you have to know who they are, what they want and how to best get their attention. That means you have to know your target groups, because knowing people is the foundational first step in building a relationship with them. It is always important to stand out in the marketplace, but with the decibel increase in the run up to the holidays, this becomes absolutely crucial. But just being the one standing on the biggest box and shouting the loudest is not going to lead to good business. If anything, it will drive customers away because they simply get annoyed. You need to be distinctive and different from the competition in a way that matters to people in some way. In a way that matters to your target groups. That also means you have to know your target groups. What happens if you don’t stand out and differentiate yourself from the competition? Yep, that’s right – people have no reason to choose you above them, so they end up using the “eenie-meenie-miney-moe” method, or worse, buy solely based on price – and we know that price competition is a slippery slope for any business! Reap the Rewards of Your Brand Building! Haven’t been focusing on building your brand? Well, commit to doing that now! Make that your new years resolution. Click here to get inspired by a few brave brands that don’t have to worry about getting heard through the noise or their customers randomly choosing other options. Oh, and worried about your business getting killed by giants such as Amazon and AliExpress? A strong brand is your only protection! Make sure you measure the results of your marketing effort. If you are not careful, it is so easy to waste money on marketing activities that are not doing anything for you. Don’t! Know what you want your marketing actions to accomplish and measure whether they are doing it. If they are, great – do more! If they are not, can you fix it? If you can’t, drop them and focus on what is working. It is always easy to get caught up in running around like a headless chicken when it comes to your marketing. And if you do that at other times of the year, oh boy, I hope some higher power steps in to help you in November and December because you will never be able to find your head otherwise! The only way to stay on top of things is to stay organized. Have a plan. Map things out. Checklists, processes, and general project management and organizational skills are like gold at any time of year, but this time of year, it’s not only gold but diamonds, platinum, rubies and all the jewels in the world. To your holiday marketing success!